Few travel destinations in the world are as enchanting as Kyoto. Simply walk among its graceful temples or stroll through one of its perfectly-manicured Japanese gardens, and it’ll all become crystal clear. That’s not to say there isn’t a best time to go to Kyoto. Time your visit for spring and you’ll be in for quite the treat: catching the Kyoto cherry blossoms at their peak. Truthfully, this isn’t just a must-do activity for Japan or Asia, but a memory that every person on earth will forever cherish. Spring in Kyoto: When is cherry blossom season in 2019? The Kyoto cherry blossom forecast changes from year to year. Most years, cherry blossoms (sakura) will start blooming towards the end of March and continue into mid-April. The peak viewing time for cherry blossoms in full bloom in Kyoto during 2018 fell between March 27th and April 4th. To get a better idea of when to catch them in full bloom, the official Japan cherry blossoms forecast for 2019 should be available in mid-January. If you happen to visit Kyoto in spring, there’ll be plenty of opportunities around the city for some serious cherry blossom viewing (hanami). In the most popular sakura spots around Kyoto, it can be a festive and joyous affair that’ll leave you spirited for the rest of your trip to Japan. One of Kyoto’s top green spaces, Maruyama Park is easily one of the best places in the city to catch the cherry blossoms at full force. During sakura season, onlookers love huddling around the park’s centrepiece massive cherry tree. It’s particularly enchanting in the evenings when it’s flooded with light. 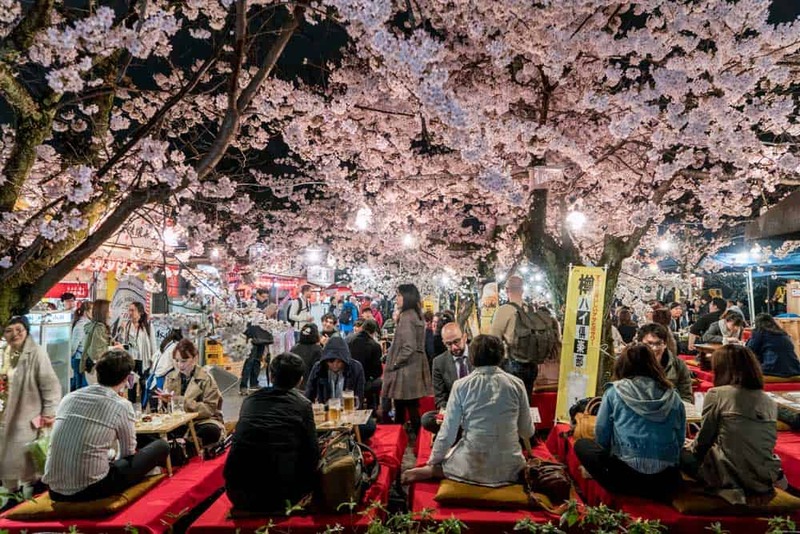 Maruyama Park is particularly festive as impromptu food stands pop up to serve delicious Kyoto street eats to the (maybe not so) raucous hanami-viewing party-goers. When you’re at Maruyama Park, be sure to also check out Yasaka Shrine at the park’s western entrance. 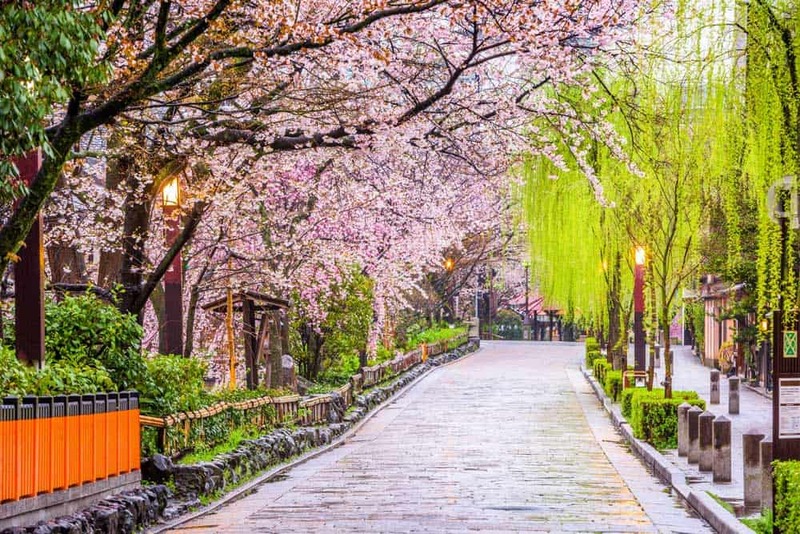 A little north of the city centre, The Philosopher’s Walk promises a stunning visual treat for your sakura-viewing pleasure. If you manage to carve out more than 24 hours in Kyoto, The Philosopher’s Walk is a must for your itinerary. Even more so, when your visit’s timed with cherry blossom season. The Philosopher’s Walk runs alongside a canal that winds between Nanzen-ji in the south and Ginkaku-ji in the north. The walking path is lined by hundreds of cherry trees that create a breathtaking scene when in full bloom. As The Philosopher’s Walk is one of the top places for hanami in Kyoto, the crowds during daytime can get a little thick. Instead, plan your visit in the evening when the cherry trees are lit up and the path is at its most memorable. 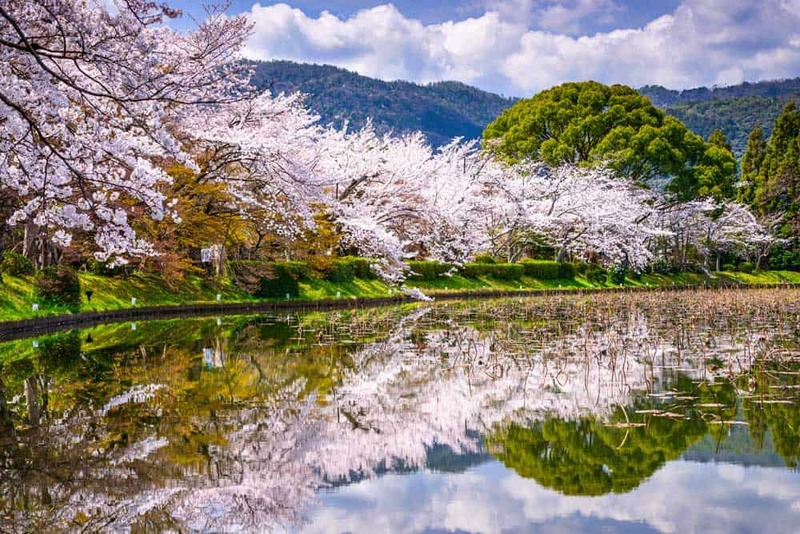 Although more famous for its bamboo forest and gang of cheeky monkeys, Arashiyama is one of the best places in Kyoto to see the cherry blossoms in full force. A few of the top spots around Arashiyama include the Togetsukyo Bridge and small island of Nakanoshima on the Katsura River in Arashiyama Park. At little further afoot, the cherry trees on the grounds of Daikaku-ji Temple are another alternative hanami viewpoint in the Arashiyama area. With travellers & locals alike labelling it as the “most beautiful street in Kyoto,” Shirakawa Minami-dori begs to be taken seriously. 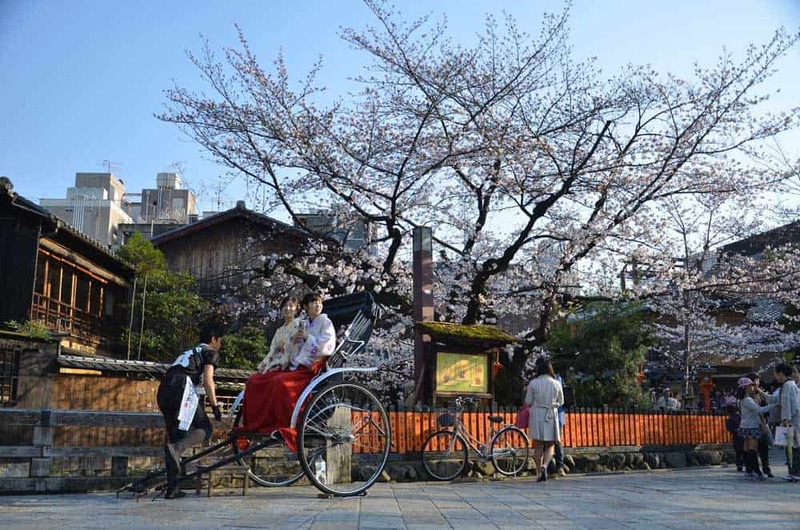 As if this canal-side street wasn’t quite lovely enough year-round, Shirakawa Minami-dori is adorned with dozens of cherry trees that render a visit during sakura season an absolute must for your Kyoto itinerary. Visit after dark when the street is at most lively—and its most stunning—as its cherry trees are lit up from below. 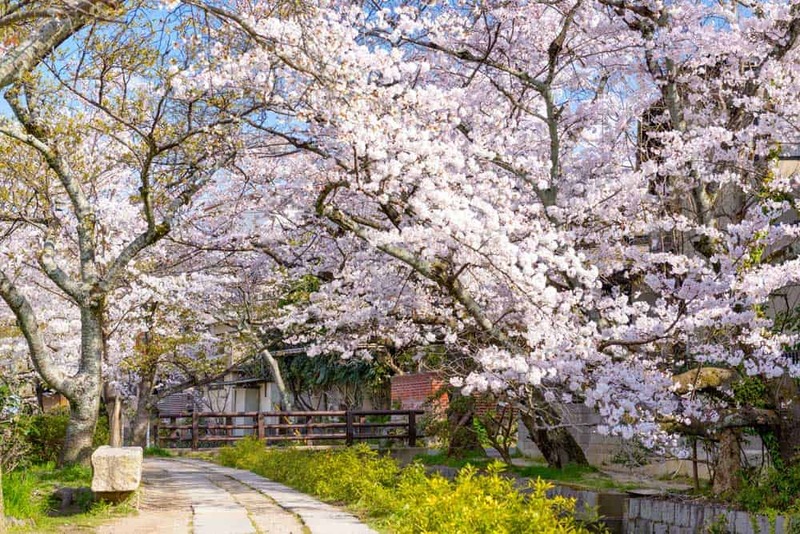 Featuring late-blooming weeping cherry trees, Heian Shrine is the perfect cherry blossom viewing spots for travellers who just missed the peak elsewhere in the city. 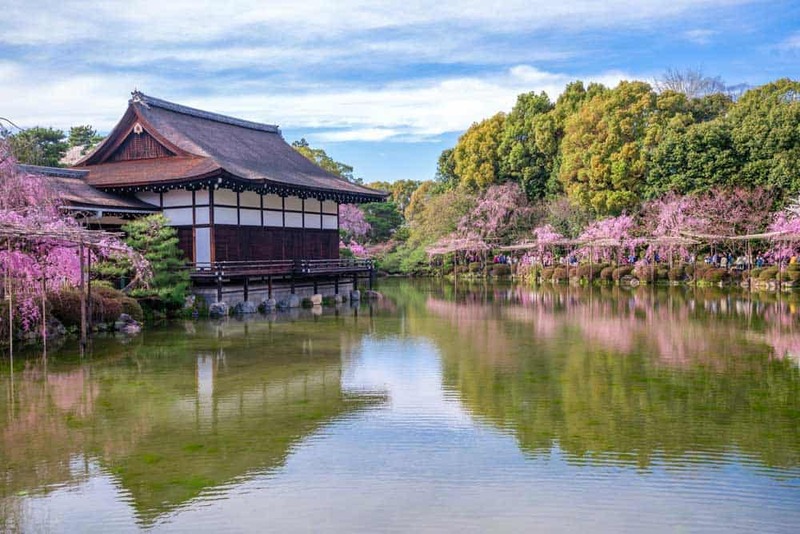 At Heian Shrine, the cherry trees creep over the garden and the pond, creating an engrossing scene that’s a boon for photographers and Instagrammers alike. Entrance to the shrine & garden costs ¥600. 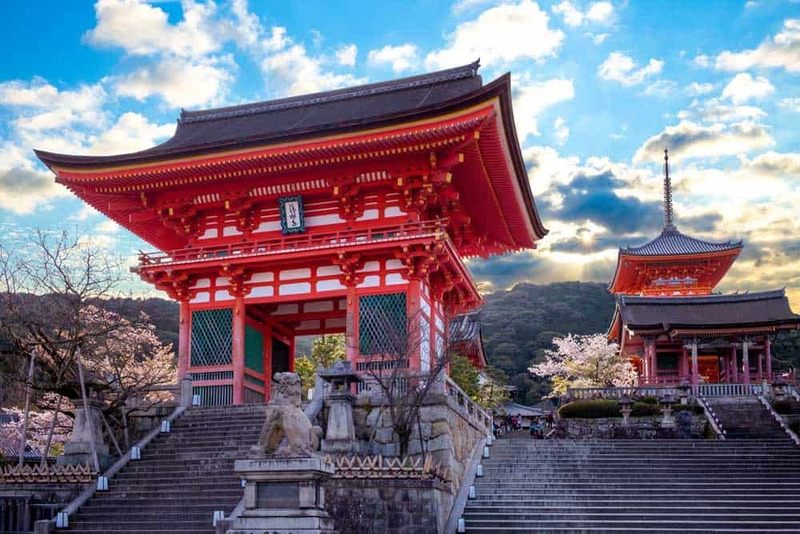 Any time of year you visit, Kiyomizu-dera Temple is one of the must-see attractions in Kyoto. During cherry blossom season, it’s even more spectacular than normal. There’s a handful of cherry trees planted around Kiyomizu-dera, one of the must-visit temples & shrines in Kyoto. From its famous balcony, you’ll catch a glimpse of a few, but it’s near the pond at the exit that you’ll see the bulk of the temple’s sakura goodness. Like some of the other top cherry blossom viewing spots in Kyoto, visit Kiyomizu-dera at night when the cherry trees are punctuated with a soft glow of light. It’s a unmissable scene that’s truly magical! As one of Japan’s top destinations, choosing among the top places to stay in Kyoto can be a bit of a challenge. And that’s especially true when you’re visiting during cherry blossom season! Guest House Oumi: A lovely ryokan (traditional Japanese inn) set in the heart of Kyoto in Nakagyo. The garden terrace here is an absolute delight. Royal Park Hotel The Kyoto: A modern 4-star hotel within a short walking distance of top hanami spots like Shirakawa Minami-dori and Maruyama Park. Four Seasons Hotel Kyoto: Set in the centre of Higashiyama Ward, this 5-star hotel features rooms that are a perfect fusion between traditional Japanese design and modern comforts. Splurge on one of the top-end rooms for unforgettable views onto the hotel’s well-manicured Shakusuien Japanese garden and pond.